SoundBio was thrilled to be a presenter at Amazon’s 4th annual AWE (Amazon’s Women in Engineering) Tech Expo on September 29th. This 3 hour event was held at Amazon’s Seattle Downtown Meeting Center, and hosted 900 registered friends and families of Amazon workers. The goal was to offer the children of Amazon employees a variety of hands-on STEM-related activities and other opportunities to help promote engineering. From robotics to 3D printers, the event had a little bit of everything! Three large screens displayed the AWE logo to welcome everyone. 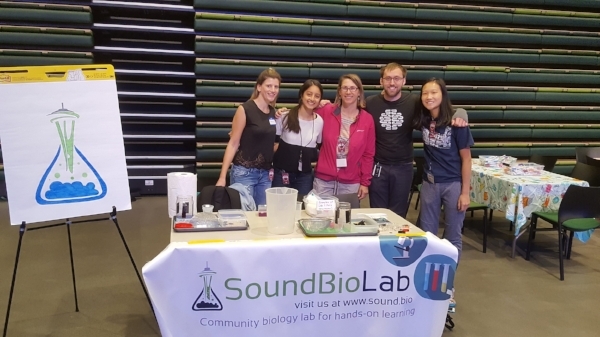 SoundBio was a popular stopping point as we demoed our microscope clips and shared our new Filtration Challenge to all the adults and children. We couldn’t help but be inspired ourselves…as our neighboring booth displayed an amazing pair of 3-D printed heels! Female engineering power at its finest. Each shoe took 30 hours to print, and were worn…exactly once. We can’t do these types of events without our wonderful volunteers, so a HUGE thank you to Christiana, Sarah, Sophie and Zach. We hope you had as much fun as the kids! Older PostCelgene & SoundBio are Teaming Up for a Biotech Workshop!